Hello, and welcome to my cartoon and comics repository! This modest site purports to contain and display many of the various cartoons, comics, and illustrations that I, John Pray, have created during my few years. Besides an occasional cartoonist, I also call myself a web developer, IT whiz, and various other things that may or not be fit to publish. Many, but not all, of the cartoons on this site were drawn for and originally published by the Cardinal Courier at Rochester, NY's St. John Fisher College, where I spent my four undergraduate years. 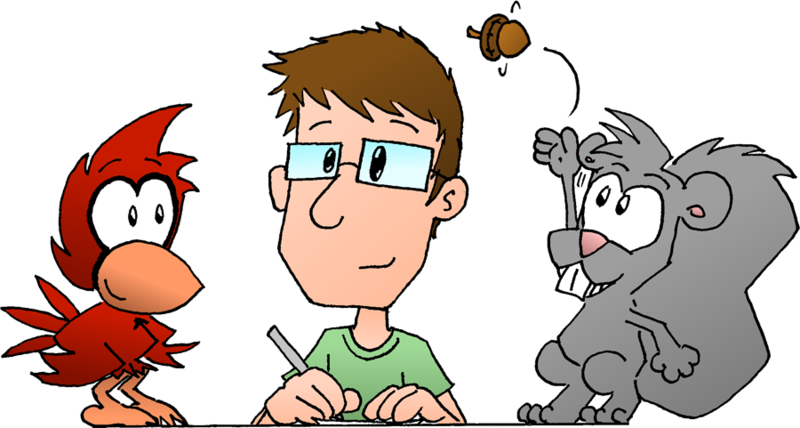 A further subset of that are the site's namesake: comic strips starring Skip the Squirrel and Cal Cardinal (whom you've already met above – I hope the acorn missed you this time). I'm almost finished uploading my entire Cardinal Courier archive, after which point I'll theoretically start drawing new comics (...we'll see). Feel free to read the comics from the beginning (though there's rarely any continuity), browse the archives for something that might interest you, or scroll to the bottom of any page for a random comic. Topic matter varies wildly, though I estimate at least half of the comics involve lame acorn jokes. For those who care about such things, this responsive site was/is coded by me on the popular-for-a-reason web development framework Ruby on Rails and web design framework ZURB Foundation 2 (only because I've been too lazy to port it to the superior Foundation 3). It's hosted mostly for free on Heroku while images reside on Amazon AWS S3. Finally, the source code is available on GitHub for your perusing pleasure.